Coordinated execution of a sequence of tasks by a group of heterogeneous agents possessing different capabilities is known to be a complex problem. Researchers have looked upon nature to capture the mechanisms embedded within the highly distributed swarms of insects to coordinate the execution of tasks by multiple entities. Stigmergy based interactions forms the key that regulates various processes within such swarms. 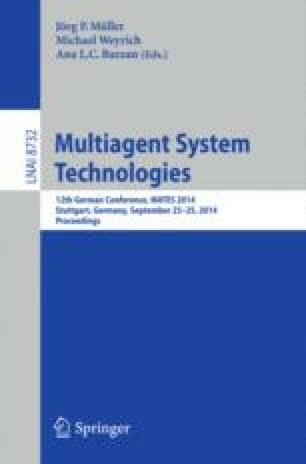 This paper describes a technique by which a heterogeneous set of asynchronous mobile agents comprising a swarm commence the execution of their assigned tasks by coordinating amongst each-other using stigmergy. These mobile agents make use of stimulations from the environment to activate the execution of a sequence of tasks on a network of nodes in a near synchronous manner. A stigmergic cloning controller facilitates the cloning of on-demand agents to provide for parallel executions. The agents also inherently exhibit self-healing. The paper also describes results obtained from emulations performed over a LAN which proves the practical viability of the proposed approach.